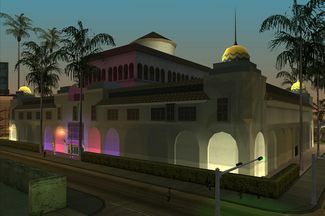 Exterior of Alhambra in GTA San Andreas. Alhambra is a club in Grand Theft Auto: San Andreas located in Idlewood, Los Santos. Carl Johnson can take both Denise Robinson and Helena Wankstein to the club during a dancing date. The club and its grounds are a turf that can be won between "Doberman" and "The Green Sabre", and after returning to Los Santos. Its interior is identical to those of Gaydar Station in San Fierro, and the unnamed nightclub in Las Venturas, containing vending machines for Sprunk and snacks, arcade machines, and a red marker where the player can access the rhythm-based dancing challenge. It also plays music from SF-UR. The building in which the club is based in is modeled after the former Los Angeles Herald-Examiner building in Los Angeles, but has been significant enlarged to be additionally comparable to the Shrine Auditorium. This page was last modified on 31 May 2013, at 06:51.